In the following I assume you’re a bit familiar with containers in general and Docker in special. That is, you at least know what docker run does. So, have you ever thought about what is going on when you execute this following, rather innocent command? The name of the guard, technically called a replication controller, is `nginx` — which happens to be the first argument of the run command. Well, that is interesting. The replication controller (or short: RC) was instructed to always keep one copy of the container around, that’s the replicas=1 argument of the run command. Since we killed the running container (technically, the pod) the RC noticed that and immediately spun up another one. You can see this by two things: 1. the pod name changed (we killed nginx-nvcnl and when we listed the pods again after this we now see nginx-4kjnj instead), and 2. the age is 11 sec, so just recently launched. The first pod (nginx-4kjnj) is apparently the original one, already running for some 9 min, while nginx-ib0ou and nginx-zjwcr are the two new pods. 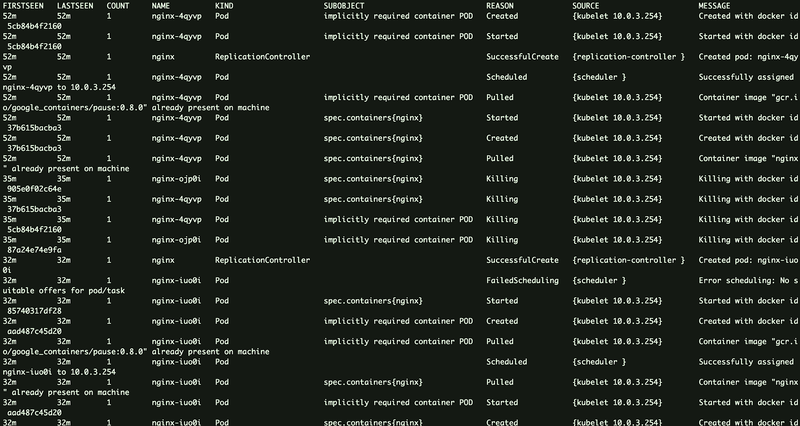 I hope you now appreciate the power of kubectl run a bit as well as all the cool stuff you get along with it, for no additional effort. Functionally it’s the same you get compared to the run command, but the manifest approach is better suited when working with a DVCS such as Git and can be easier re-used across teams and projects.